For courses in Quantum Chemistry. 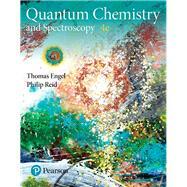 Engel and Reid’s Quantum Chemistry & Spectroscopy provides a contemporary, conceptual, and visual introduction to physical chemistry. The authors emphasize the vibrancy of physical chemistry today and illustrate its relevance to the world around us, using modern applications drawn from biology, environmental science, and material science. The 4th Edition provides visual summaries of important concepts and connections in each chapter, offers students “just-in-time” math help, and expands content to cover science relevant to physical chemistry. Tutorials in Mastering™ Chemistry reinforce students’ understanding of complex theory in Quantum Chemistry and Thermodynamics as they build problem-solving skills throughout the course. Mastering™ is the teaching and learning platform that empowers you to reach every student. By combining trusted author content with digital tools developed to engage students and emulate the office-hour experience, Mastering personalizes learning and often improves results for each student. Instructors ensure students arrive ready to learn by assigning educationally effective content before class, and encourage critical thinking and retention with in-class resources such as Learning Catalytics. Note: You are purchasing a standalone product; Mastering Chemistry does not come packaged with this content. Students, if interested in purchasing this title with Mastering Chemistry, ask your instructor for the correct package ISBN and Course ID. Instructors, contact your Pearson representative for more information. Thomas Engel taught chemistry at the University of Washington for more than 20 years, where he is currently professor emeritus of chemistry. Professor Engel received his bachelor’s and master’s degrees in chemistry from the Johns Hopkins University and his Ph.D. in chemistry from the University of Chicago. He then spent 11 years as a researcher in Germany and Switzerland, during which time he received the Dr. rer. nat. habil. degree from the Ludwig Maximilians University in Munich. In 1980, he left the IBM research laboratory in Zurich to become a faculty member at the University of Washington. Professor Engel has published more than 80 articles and book chapters in the area of surface chemistry. He has received the Surface Chemistry or Colloids Award from the American Chemical Society and a Senior Humboldt Research Award from the Alexander von Humboldt Foundation. Other than this textbook, his current primary science interests are in energy policy and energy conservation. He serves on the citizen’s advisory board of his local electrical utility and his energy efficient house could be heated in winter using only a hand-held hair dryer. He currently drives a hybrid vehicle and plans to transition to an electric vehicle soon to further reduce his carbon footprint. Philip Reid has taught chemistry at the University of Washington since 1995. Professor Reid received his bachelor’s degree from the University of Puget Sound in 1986 and his Ph.D. from the University of California, Berkeley in 1992. He performed postdoctoral research at the University of Minnesota-Twin Cities before moving to Washington. Professor Reid’s research interests are in the areas of atmospheric chemistry, ultrafast condensed-phase reaction dynamics, and organic electronics. He has published more than 140 articles in these fields. Professor Reid is the recipient of a CAREER Award from the National Science Foundation, is a Cottrell Scholar of the Research Corporation, and is a Sloan Fellow. He received the University of Washington Distinguished Teaching Award in 2005.